Frustrated by the artifacts? Puzzled by the pixel degradation? Yes, Facebook takes your photos and squashes them down to more download-friendly sizes and in that process turns your art into… lower resolution art. So you’ve taken a fantastic pic and want your client and all their friends (and all their friends’ friends) to see it but, dash-it-all, it looks like garbage! What they hay? When this happens and you want rectification, Portable Network Graphics files are your new friend-o. 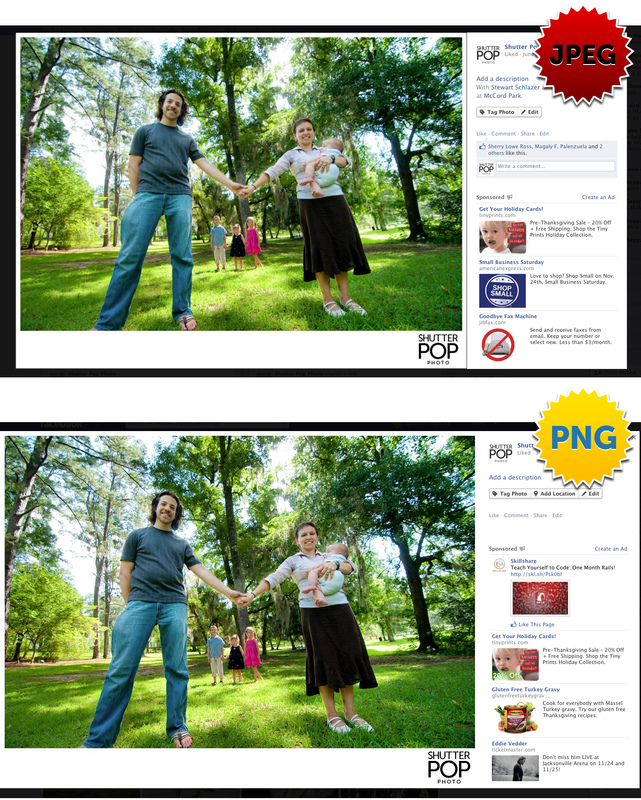 PNGs for short, pack a larger file size than the JPEGs you’re used to, but the fidelity in the quality is beyond compare. Not sure if this is a photographer’s secret that others are hiding but I follow plenty of other professional companies whose photos turn out junked up by Facebook. So… I pick my RAWs in Bridge, edit in Photoshop, batch convert to hi-res JPEG with Automator, batch scale and convert those hi-res JPEGs to PNGs at 1000px on the longest side (again in Automator) at 72dpi. On Facebook they take about 3-5 seconds longer to load and view on a cable modem but hot damn if the difference isn’t astounding. This is a problem that’s plagued me for some time now and with all the comments and likes on previous photos it would be insane to go back and re-upload all our albums but at least I know for the future. Check out the detail loss in the hair, the artifacts around the face, and the general degradation in the first photo, which is a screenshot of a photo on our Facebook page. The photo looks fuzzy and sharp edges disappear. But the second screenshot (also from our Facebook page), saved as a PNG, sees those problems vanish! Click the photo for a larger version. I specifically remember this next photo being a major pain in the rear. I uploaded it and deleted it. Uploaded it again and then, again, deleted it. The photo on the hard drive looked great! The photo on Facebook looked embarrassing. First photo: fuzzy, unsharp, artifacts, blah. Second photo: great quality, totally sharp. 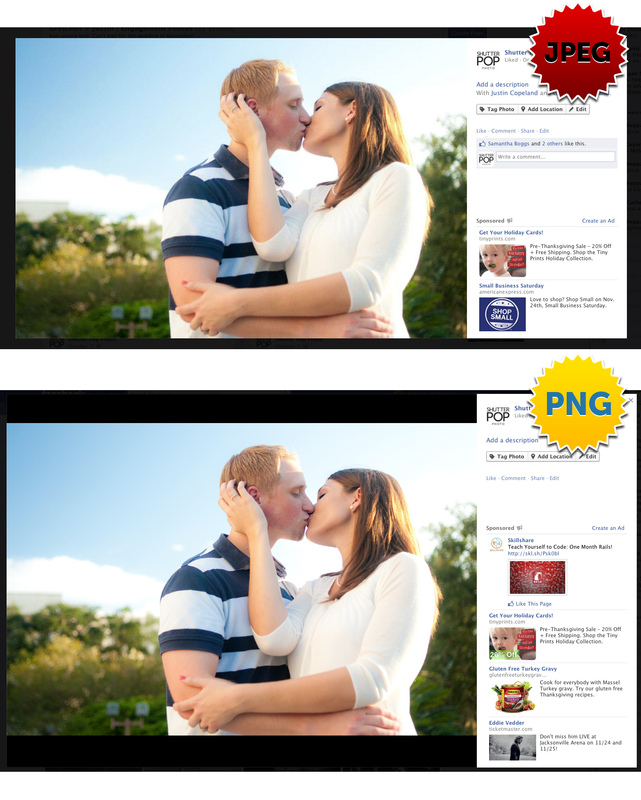 Both photos are screenshots of Facebook business page uploads, there is no sorcery going on here. Photoshop Actions, Where Have I Been?